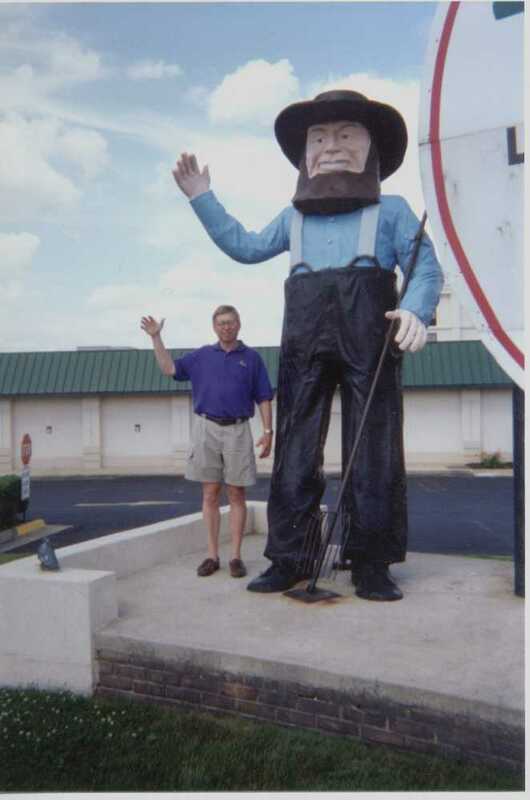 Other Big People – Page 3 – The Home of My "Big Things"
On our way to visit New Harmony, an intentional community, where we were to meet up with Catherine and Dale we passed through Evansville. Before we got there we hit a bonanza of Big Things. 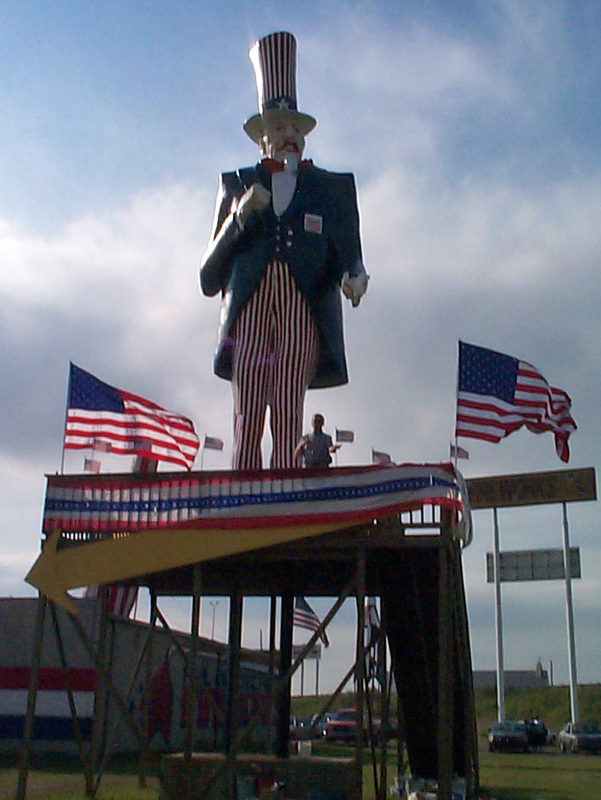 Most were Animals at Jim Hipp’s Nursery, but we did get this Big Uncle Sam outside Busler’s 24 Hour Market. I think he needs a little more care than he gets. We were in Louisville celebrating our 35th Wedding Anniversary. 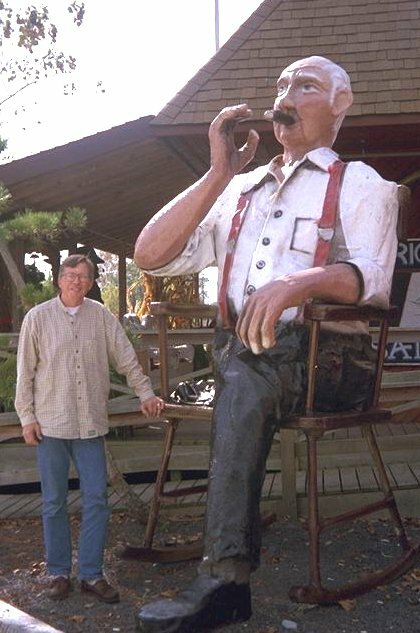 Of course I have a photo of the big Louisville Slugger Bat (See Big Objects page) but on the way home we made a quick side trip to Jeffersonville, Indiana to grab this Big Lady metal sculpture just across the border in Indiana. 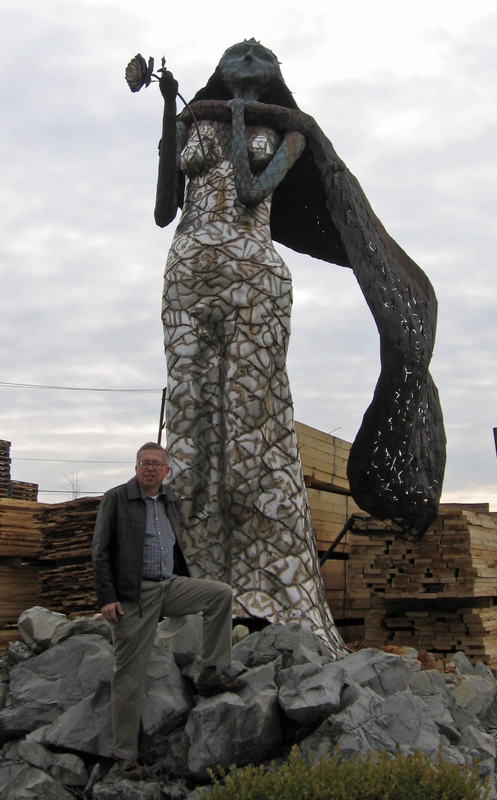 She stands proudly nearby a lumber yard on Dutch Lane. Here I am “working” again – I like the sound of that and use it often. At any rate I was at a Grand Opening of a store and there were many vendors there with inflatables. More inflatables from this event are on the Automotive and Objects pages. 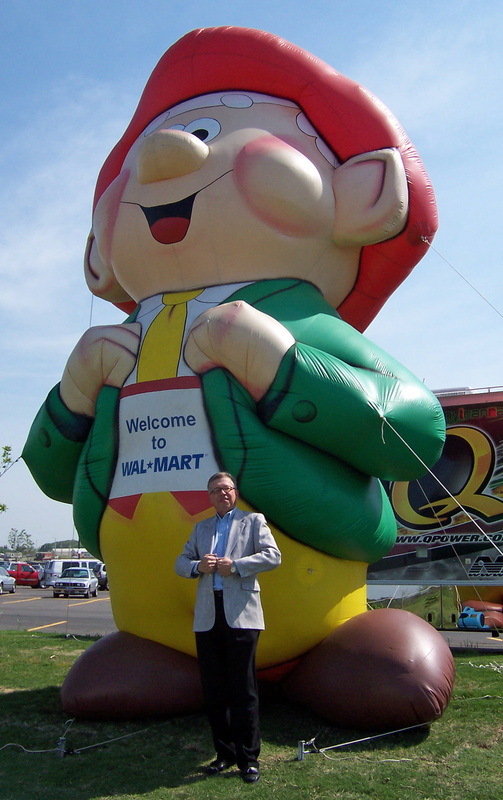 Here is the Keebler guy, a Leprechaun I guess. 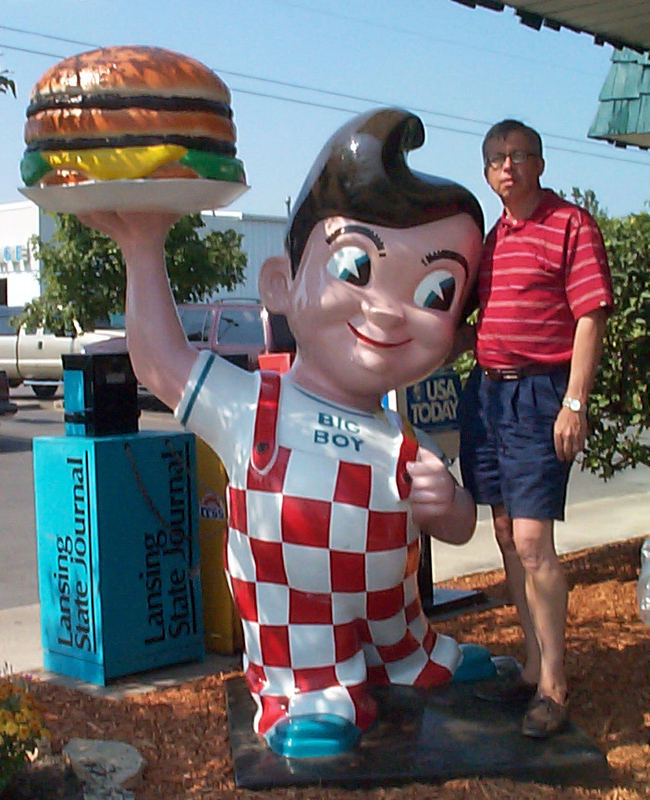 I spent a lot of time cruising the Big Boy restaurants on 8 Mile Road as a teenager. 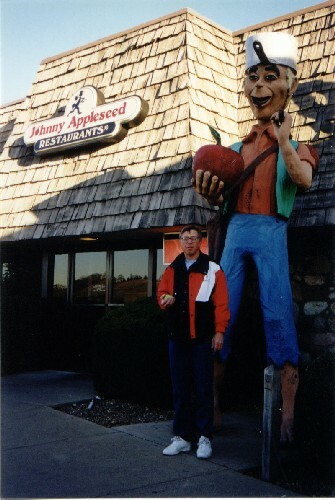 Their strawberry pie was my favorite but the “Big Boy” hamburger was a Big Mac before we had Big Mac’s, with it’s own secret sauce and all. 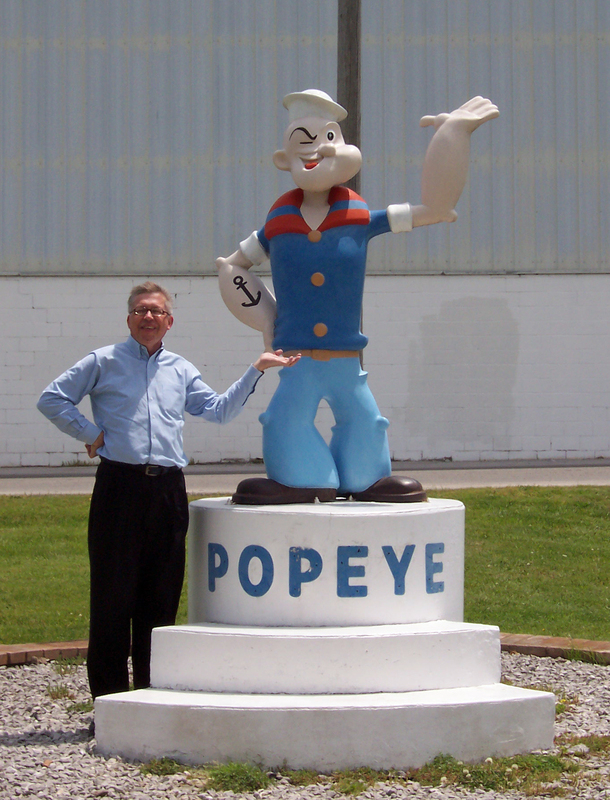 I had to include this home town favorite. 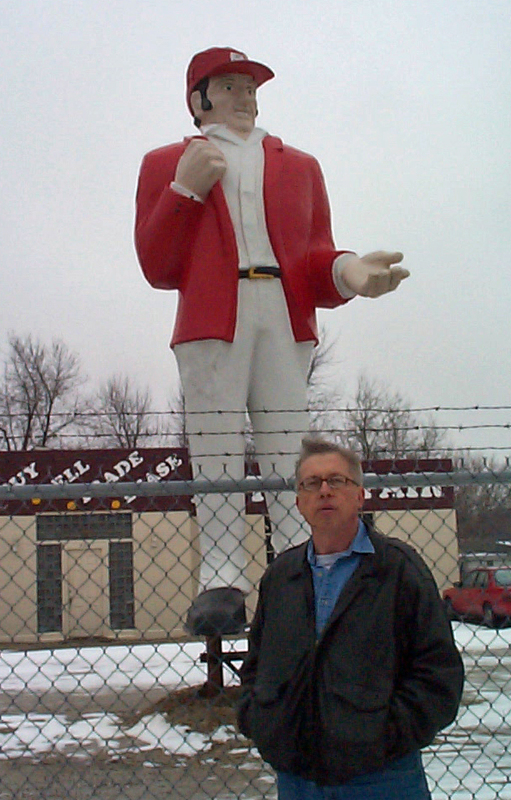 This guy who looks like a Big Jockey to me was standing inside the Pam Reason’s Auto Sales lot. The lot looked closed with few autos but if you want to see this guy it is at 305 W 26th Street at the corner of Elm. 1 block West of Madison. On the way from Maryland to Indianapolis we stopped to get an image of a Big Gorilla that Julia spotted. 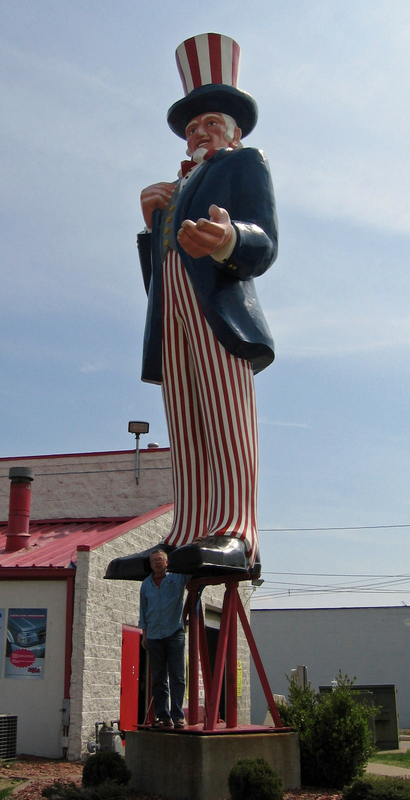 Right next to it was this big Uncle Sam outside Rainbow Industries in Harmony, Ohio. By the way, there is a good vegetable stand right across the street. 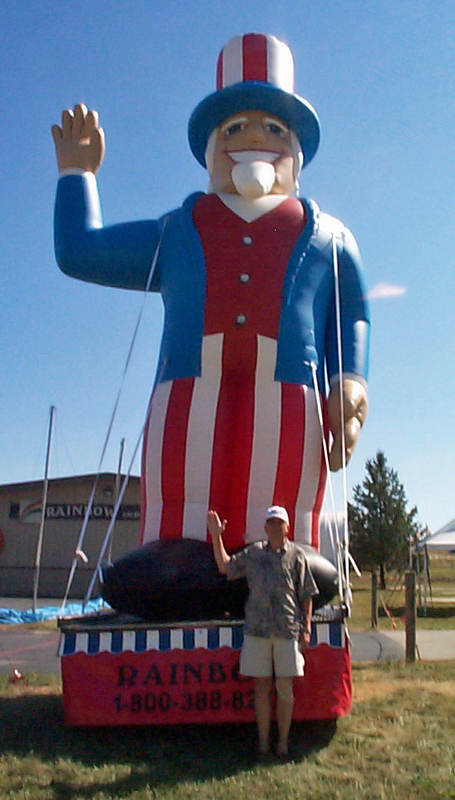 These inflatable Uncle Sam’s are a very rare “triple.” Driving into Michigan on July 3rd there are several fireworks stores at Sterns Road (Exit 1) and US-23. The left photo was taken at Star Fireworks. they must have great prices since they had a man directing traffic into the parking lot and a huge pile of empty fireworks boxes. 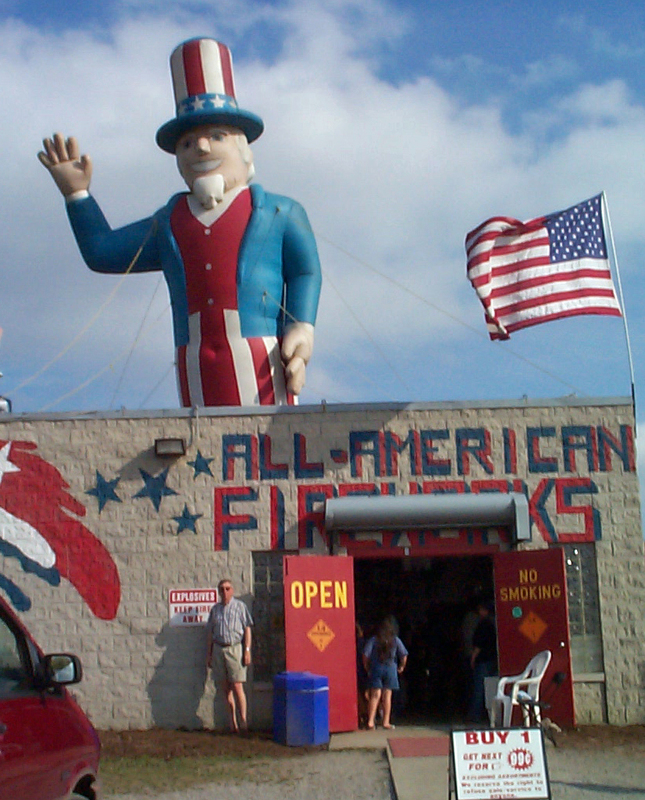 Across US-23 on the west side of the road was the All American Fireworks store (center.) The crowd wasn’t quite as big but they were hustling some pretty good numbers here as well. The Uncle Sam stood watch over the entrance. Notice the “No Smoking” sign, Duh! 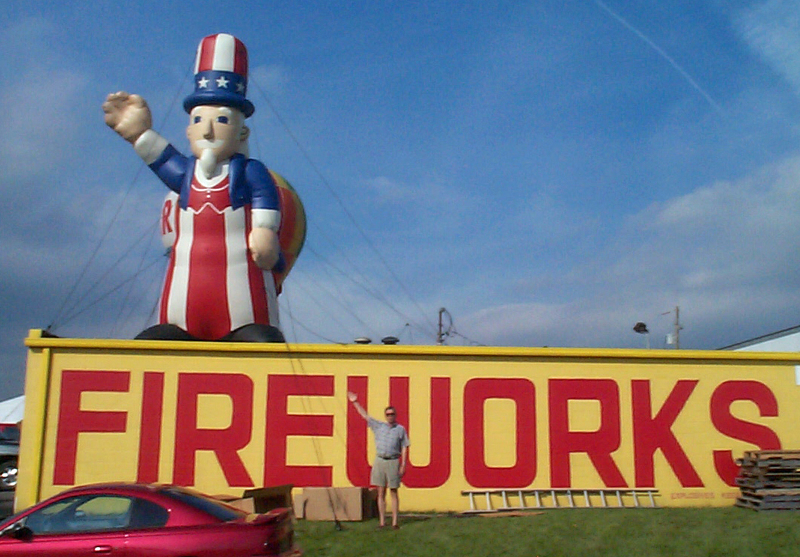 The Uncle Sam inflatable on the right is the one that caught Deb’s eye as we were driving up 23. Actually she was looking for a White Castle so we could get a fix, but she spotted this guy up on his platform and decked out for the 4th of July. Quite the find. 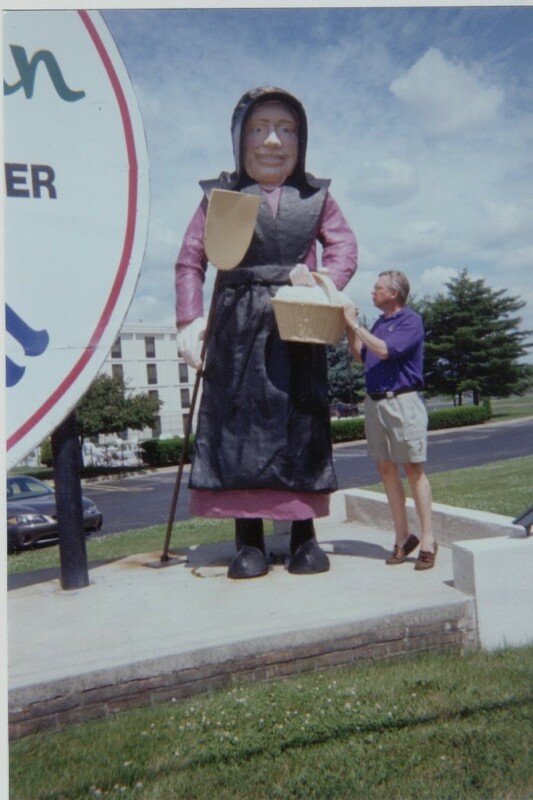 The Amish couple stand in welcome outside a Holiday Inn in Lancaster, PA. If you didn’t know it already, this is in the heart of Amish country. Shoo Fly pie anyone? We took these images after dropping Julia off at Millerburg College. She was starting an orientation session prior to leaving for Europe on an American Music Abroad program. A new “Bird Dog,” Dennis Wall, told me about this big guy. 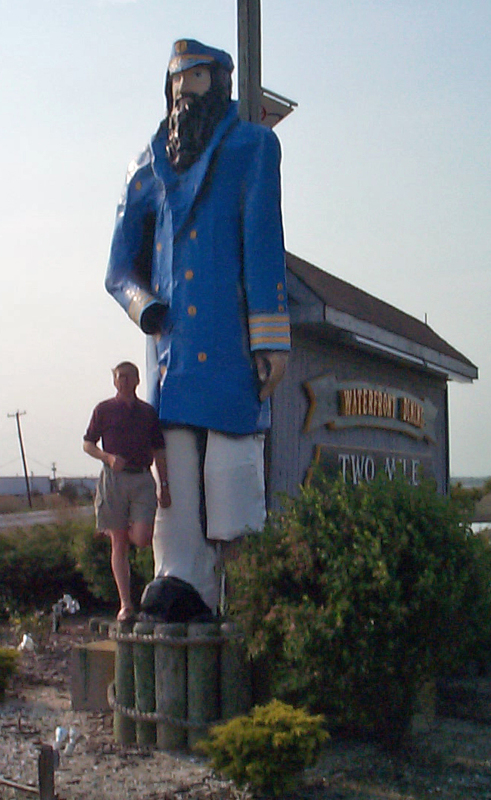 He stands at the entrance to a Jersey Shore restaurant named Two Mile Landing. It’s on Ocean Drive south of Wildwood Crest. After taking this photo we went inside to watch the Kentucky Derby. Monarchos won and paid $23.00. A lot of luck is involved in getting the opportunity to get a good photograph. Parents Weekend 1998 at JMU and we were staying 25 miles from school. Our motel restaurant was packed so we figured to go to the next exit and eat there. Wham! A Big Picture opportunity. Deb even had an apple in her handbag. I’ll have to say that this is one of the more “interesting (at least to me) Big People.” Certainly has big “attributes” that fit the category. Funny thing was that this was one of the harder photos to take because there were so many people attracted to this object. Here’s a cool guy. Definitely someone to be reckoned with. Found him (remember the found art stuff) on the way to the shore with 6 women in the car for Julia’s Birthday (Lucky me?) At any rate since he is “substantial” the purists can be happy. He can be found on Rte. 47 in S. Dennis in South Jersey. I suppose if there were other people that did what I do they would object to including inflatables as not being “substantial.” I take the opposite view. I like finding Big Things and since inflatables are so transitory they are more than found art, they are lucky timing art. 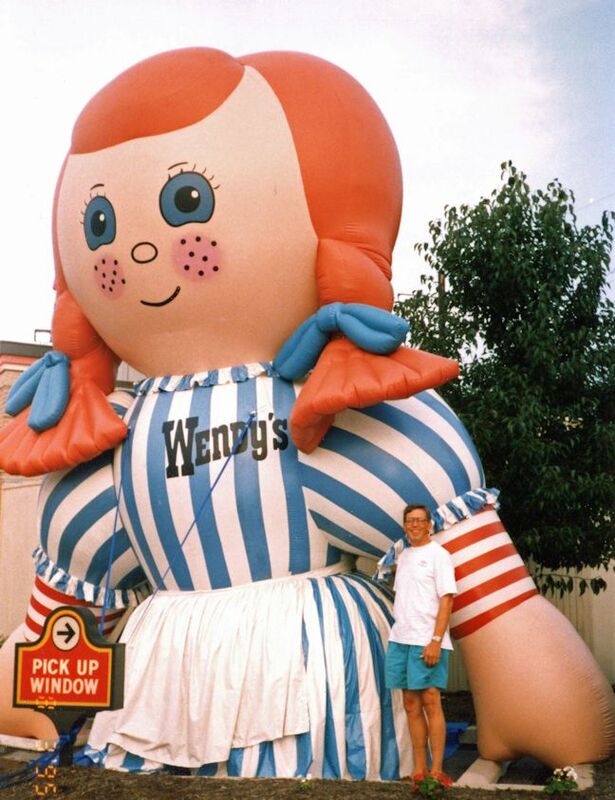 Wendy is a case in point. Thanks to Nancy. I think that when I found Mr. Zinn I realized what “found art” meant. We had stopped for breakfast here and were walking up to the diner when lo and behold a big picture opportunity! 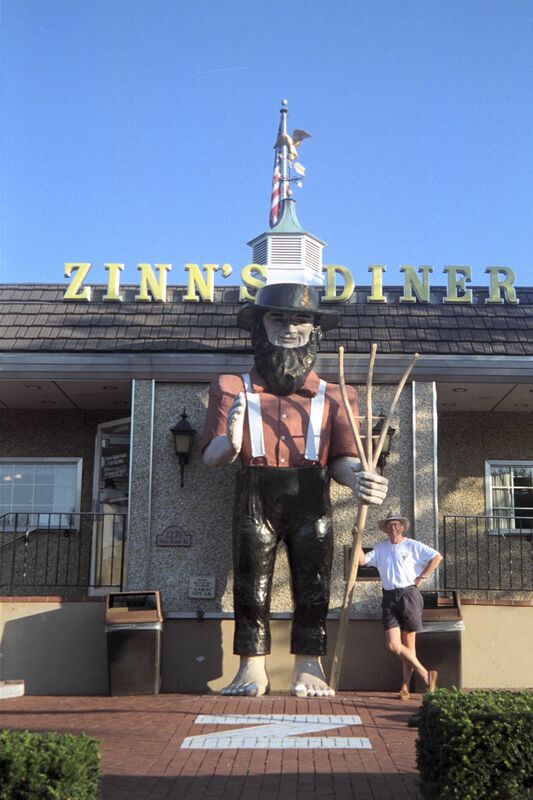 And this wasn’t this first time we stopped as Zinn’s either. Let that be a lesson to you.